I recently saw on the news that here in the UK, it is being considered to not let children go to school unless they've had their MMR jabs (immunisations) - this is ridiculous! Are they going to be quite happy to let you keep your kids off school indefinitely unless you let them have the jabs?! Or maybe they are planning on forcing people to have their children immunised?! To be honest, I am completely outraged! My son has not had any jabs and I have no intentions whatsoever of him ever having any. I never had any when I was a kid either and I'm still here! 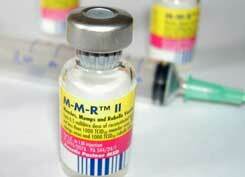 The MMR jab wasn't even around some years ago, but older people who it wasn't available to are still around! My younger sisters haven't had them and they're OK too. My reasons aren't religious or anything, I simply don't trust them - I do not think they are safe. But there are people who refuse them for religious reasons as well. I just think it is a ridiculous concept that you would need to be forced to let your children have the immunisations so they can go to school! I would rather keep my son at home and educate him myself rather than be forced to let him have the MMR jab in order for him to go to school - that's how strongly I feel about it! I do wonder if the so-called *immunisations* aren't what "the label says" and if they are just a way for you to be tracked by the government! Both my children have had the jabs but I wasn't sure about it,my grandad always said that they didn't need that "muck" pumped into them!